Our practice identified several issues with the commercially available plastic off-the-shelf Sarmiento brace that is used in managing humeral shaft fractures, with regards to comfort, moulding, and ability to hold reduction. A custom-moulded fibreglass brace was developed which was soft padded for comfort, lightweight, and could be adjusted with changes in swelling. 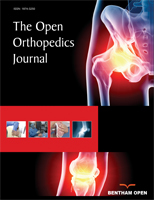 The aim of this study was to evaluate the use of this new brace. 16 patients were identified having treatment with the brace from March 2011 to July 2013. Retrospective analysis of medical records and imaging occurred to assess union and angulation. Prospective analysis of patient function was assessed with the CONSTANT, DASH and SPADI Shoulder score. Patients were initially managed with a U-Slab for an average of 26 days. Patients were followed up for an average of 70 days post brace application. 5 patients were lost to follow up. The remaining 11 patients had the brace on for an average of 73 days. In the last follow up, 15 patients had an acceptable anterior/posterior angulation of less than 200 (1 patient - 220), varus/valgus angulation less than 200, and less than 3cm of shortening. 12 patients had radiological evidence of union, with the other 4 demonstrating significant callus. 4 patients were recruited for prospective analysis with DASH, SPADI and CONSTANT shoulder scores, and demonstrated minimal loss of function. There were no complications of bracing treatment. Our new functional brace led to bony union in most patients, and from a clinical perspective, most patients were pain free and had minimal loss of function. Keywords: Bracing, Custom bracing, Swelling, Functional bracing, Fibreglass, Humeral shaft fractures, Sarmiento. © 2019 Athreya et al.